Conagra Brands, Inc. is recalling approximately 700,125 pounds of spaghetti and meatball products due to mis-branding and undeclared allergens, the U.S. Department of Agriculture’s Food Safety and Inspection Service (FSIS) announced June 10th. The product contains milk, a known allergen which is not declared on the product label. 14.75-oz. cans with “Libby’s Spaghetti and Meatballs MADE WITH PORK, CHICKEN AND BEEF IN TOMATO SAUCE” on the label with package code 2100701200 and Use By Date 01/02/19. 14.75-oz. cans with “Del Pino’s SPAGHETTI & MEATBALLS MADE WITH PORK, CHICKEN AND BEEF IN TOMATO SAUCE” on the label with package code 2100701200 and Use By Date 01/02/19. 14.75-oz. cans with “Hy-Top Spaghetti and Meatballs Made with Pork, Chicken and Beef in Tomato Sauce” on the label with package code 2100701200 and Use By Date 01/02/19. 14.75-oz. cans with “Food Hold Spaghetti & Meatballs MADE WITH PORK, CHICKEN AND BEEF IN TOMATO SAUCE” on the label with package code 2100701200 and Use By Date 01/02/19. 14.75-oz. cans with “Essential EVERYDAY Spaghetti with Meatballs Made With Pork, Chicken and Beef in Tomato Sauce” on the label with package code 2100701200 and Use By Date 01/02/19. 14.75-oz. 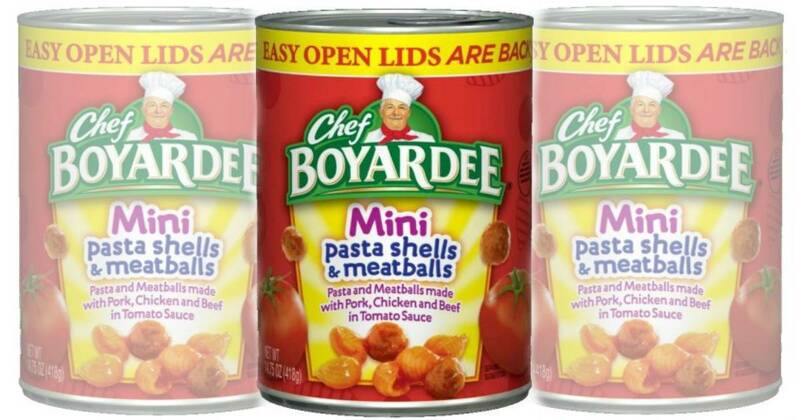 cans with “Chef BOYARDEE Mini pasta shells & meatballs, Pasta and Meatballs made with Pork, Chicken and Beef in Tomato Sauce” on the label with package code 2100700500 and Use By Date 12/26/18. The products subject to recall bear establishment number “EST. 794M” inside the USDA mark of inspection. These items were shipped nationwide to warehouses for distribution to retail locations. The problem was discovered on June 6, 2017, when Con Agra received notification from of of their ingredient suppliers that the bread crumbs the company received and used in the recalled products potentially contained undeclared milk. There have been no confirmed reports of adverse reactions due to consumption of these products. Anyone concerned about an injury or illness should contact a healthcare provider. Consumers who have purchased these products are urged not to consume them. These products should be thrown away or returned to the place of purchase. Consumers with questions about the recall should contact Conagra customer service at 1 (866) 213-1245. So it sounds like its not a safety issue for those who are not allergic just they didnt list an ingredient? Yes in this case. They issue recalls for all sorts of reasons. It’s a safety concern for anyone w allergies in this case.